Could you confirm a second preferred date? 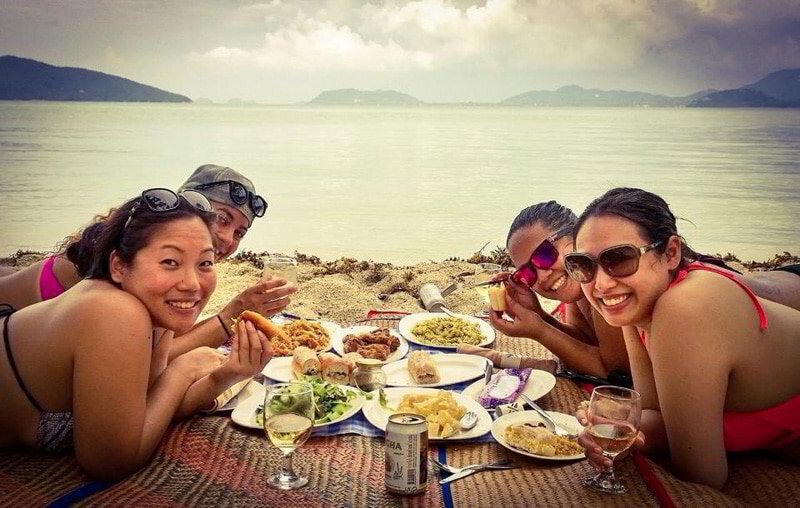 The only gourmet beach picnic tour on Koh Samui. This tour is nothing like the ordinary and best enjoyed by those who are seeking privacy and unforced itinerary of their day. Our main destinations are Koh Tan and Koh Mudsum, two islands located on the south of Koh Samui. Away from the mainstream tourist attractions, we aim to provide quality snorkeling experience and a rustic beach picnic experience in a secluded beach location. Our standard tour includes a boat ride on board a traditional long tail boat. Though we set a standard itinerary for the tour, guests are allowed to customize their day. Since each and every tour is private, our guests hold their own time and can spend as long as they want relaxing on the beach, snorkeling, or even lengthen the cruise on their private boat. Romantic Picnic Special for TWO: THB 8,880. Includes return transfer, private long tail boat ride, life jackets, snorkeling equipment, picnic lunch, Prosecco wine, beers, soft drinks & water, accident insurance, first aid kit, personalized gift. We will collect you from your resort or private villa at our agreed time. You are transported to the pier where your private long tail boat is waiting. Before boarding, we will conduct a short briefing and will explain how our day will pan out. We advise that you already wear your swimming costumes as you might get splashed during the boat ride. Toilet facility is available at the pier and please remember, once we set off, you have a choice of water, jungle or sand. We stop at a snorkeling point where you can enjoy swimming with the fishes (for as long as you want)! Since its a private tour, you don’t need to worry how long you are allowed to swim for. Most people spend an hour maximum at this point but you can tell us if you need less or more. For those not wanting to swim, you are free to stay on the boat and feed the fishes! The highlight of the tour is our delicious picnic lunch. After snorkeling, the boat will take us to a secluded spot on the beach either at Koh Taen or Mudsum (depending on the time of the year, the weather and tide situation). Once we reach our destination, allow us a few minutes to set up your mat, your picnic hamper and serve you with some ice cold drinks. Your chosen picnic hamper will be prepared and will be served as family sharing style. Indulge in wines, beers or chill with soft drinks if you want. After you’ve eaten, you have some relaxation time. You can choose to have a walk on the beach, have a little swim, snooze for a bit or chat with us! The least favorite part of the day. But we gotta do it! We pack our hampers and board the boat. With 15-20 minutes ride, we are back at the pier. You can use the toilet facility to change to your dry clothes before getting in the car. You will be back to your resort feeling great. The pool is there and maybe happy hour is on! Your menu is fully customizable. Please feel free to let us know any dietary requirements.